Diabetes is a common problem among the American population and worldwide. Aside from the impacted life span and quality of life, diabetes is associated with an increased burden on society in relation to medical costs which has a great economic impact. The most influential factors that have been found to be related to diabetes include genetic factors and environmental influences. While you may not be able to change your genetics you can make a change on environmental risk factors. Obesity and inactivity are two of the main risk factors of acquiring diabetes. Environmental factors may be mostly modifiable which means that many people that acquire diabetes may have been able to avoid this condition and may also be able to reverse this condition with lifestyle changes. Diet is a crucial aspect of the overall management of diabetes as well as exercise and physical activity. Type 2-diabetes can be difficult to treat and can be expensive to manage and that is why avoiding this diagnosis is imperative. Diabetes occurs because the body does not produce or does not properly use insulin. Insulin is a hormone that is produced by the pancreases that allows glucose or sugar to enter the cells. If the pancreas is unable to produce enough insulin or when muscle, fat, and liver cells do not properly respond to the insulin that is there then glucose builds up in the blood which can become toxic. Hyperglycemia is a condition that occurs when there is too much glucose in the blood. Type 1-diabetes is not related to diet and inactivity but is the type of diabetes that occurs in children and young adults and is the result of the immune system destroying the insulin-producing cells of the pancreas. This article will focus now on how to reduce the risk of type-2 diabetes and how to reverse or reduce the effects with the use of exercise. Exercise can help the cells of the body take up glucose and lower blood glucose levels. Physical activity can help with weight loss and can decrease the overall effect that diabetes has on the body. Regular exercise can decrease the need for insulin, the risk of obesity and the risk of heart disease. The exercise recommendations from the American Diabetes Association include participating in physical activities of high or moderate intensity exercise lasting for more than 150 minutes a week in order for the activity to counteract the effects of diabetes. Walking is an easy exercise to get activity and if someone is at a lower level in regards to cardiovascular ability or aerobic capacity this may be a good place to start. It is important that this activity is supervised or monitored to decrease the risk of insulin imbalance. Physical activity can help body cells take up glucose and lower blood glucose levels. Regular physical activity also helps with weight loss as well as controlling blood cholesterol and blood pressure. Physical activity needs to be balanced with medication and diabetic meal planning and the doctor and the dietician should be made aware of the amount of physical activity the patient is getting. The benefits of regular aerobic exercise in diabetes management include decreased need for insulin, decreased risk of obesity and decreased risk of heart disease. 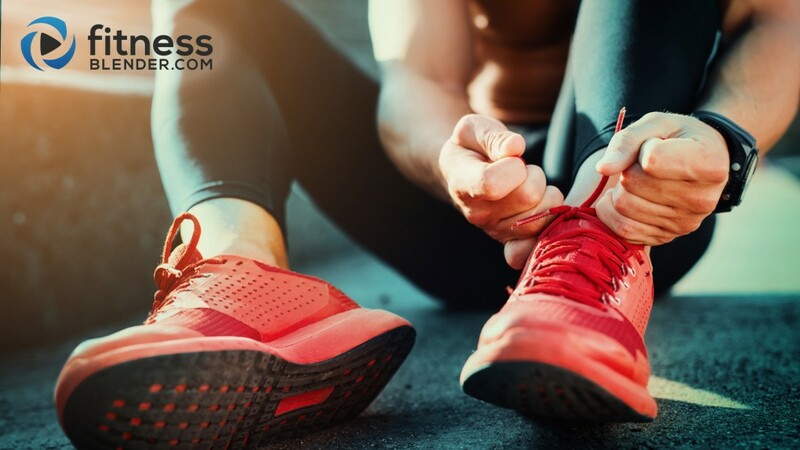 Exercise can help to decrease total cholesterol and can improve the ration of low-density lipoprotein (LDL) to high-density lipoprotein cholesterol (HDL) and reduce blood triglycerides. Physical activity may also decrease blood pressure and lower stress levels. How much exercise and what kind? The American College of Sports Medicine recommends exercising at least three times a week for 20 minutes a day at a high intensity or exercising at least 5 times a week for 30 minutes at a moderate intensity. Walking is one of the easiest ways to get exercise. Walking can be done throughout a person’s lifetime without any special equipment and with little risk of injury. Supervised activity may be best due to the risk of insulin imbalance. Other aerobic activities may also be performed in order to get in the amount of exercise necessary to reduce the effects of diabetes on the body including bodyweight cardio, swimming, biking, running and any other aerobic activity that someone may enjoy to get in the exercise time required. Resistance training is also beneficial for those with diabetes. Resistance training can help to improve the biological effects of diabetes. The guidelines suggest that in addition to the aerobic exercise a person should perform resistance training should be performed between 2-3 times per week at a duration of at least 60 minutes each. A combination of aerobic activity and resistance training has additive benefits on glucose control and can help to achieve a greater reduction in Type-2 diabetes than performing one or the other. Lifestyle interventions such as changes in a persons’ diet, increasing physical activity throughout the day and participating in regular exercise can make an impact on the diagnosis and treatment of diabetes. It is important to realize that you can decrease your risk of diabetes with lifestyle changes and that even if you have an increased risk of diabetes due to genetics you can influence your environmental risk factors to decrease the overall risk of acquiring this condition. It is also important to realize that if you do get diagnosed with diabetes you can still make lifestyle changes to decrease the impact of this disease on your body. Note: Always make sure to consult your personal health care provider, who has all of your health information and history, before making any changes. Aguiar EJ, Morgan PJ, Collins CE, Plotnikoff RC & Callister R. Efficacy of interventions that include diet, aerobic and resistance training components for type 2 diabetes prevention: a systematic review with meta-analysis. International Journal of Behavioral Nutrition and Physical Activity. 2014; 11 (2). Asif M. The prevention and control the tpe-2 diabetes by changing lifestyle and dietary pattern. J Educ Health Promot. 2014; 3(1). Mynarski W, Cholewa J, Rozpara M, Borek Z, Strojek K & Nawrocka A. Recommendations for health-enhancing physical activities in type 2 diabetes patients. J Phys Ther Sci. 2015; 27:2419-2422. Good nutrition should taste great and make you feel even better! 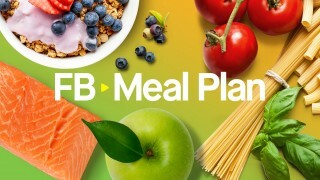 Built with registered dietitians, this healthy, whole foods meal plan details 3 meals, and 3 snacks, every day for four weeks. Get your entire workout - warm up, HIIT, strength and cool down - done in right around 30 minutes. All you need is an optional set of dumbbells. 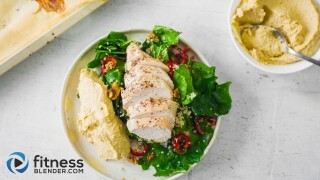 The great balance between fiber, protein and vitamin quantity is what makes this salad the perfect to-go option. It's easy to make ahead of time for a healthy lunch at work!